T-Mobile’s @tmobilehelp Twitter account spilled the good earlier today “announcing” that the first LTE BlackBerry, the Z10 will be available next Tuesday, March 26th. All this time we thought it would be the following day, March 27th as first discovered on a roadmap early in February. We’re perfectly happy with the device releasing one day earlier which makes perfect sense as it coincides with T-Mobile’s special media event. So, BlackBerry fans, mark the date and get ready. LTE, BlackBerry 10, T-Mobile…the exact combination a BlackBerry fan needs. Yup. This non-subsidy model is going to turn people off. Unless the up front cost on EIP is â‰¤ competing networks’ prices for the same devices on 2-year agreements this is going to be a nasty summer for TMo. The EIP down payment usually matches the subsidized upfront cost of other carriers. The two that they are selling are not the best ones to get for T-Mobile customers. We want the STL 100-3, which usually costs more than the two on that site. Though unless I am mistaken this means they did fail at being the first to bring it. AT&T is the 22nd if I recall. It has been available for a few days already for my business folks. We on the other hand had to wait!!!. There gonna turn it on, or at least I hope so. Bring on lte baby. yep, they failed to be the first and the stores I called still have no idea and the website still says coming soon with no price…very annoying. I won’t disagree with that. I’m very impatient for this phone though. In my mind the announcement publicly like that with not specifying “business” means they were aiming to be first to supply for all customers. And AT&T has it released for all customers first.. So if they want to hang on to that technicality it’s pretty hollow. Well well well. A day early as T-Mobile schedualed the release of the Blazkberry Z10 4G LTE. Pocketnow’s Jaime Revera said that T-Mobile plans to launch their 4G LTE network around March 26 or by the end of March. Starting first with Las Vegas and Kansas City. I hope T-Mobile sticks to their word because 20mbps isn’t still fast enough for me when I’m downloading movies from Google Play Store and 1GB+ games. Just today I re-downloaded my Need For Speed game and it was about 610MB and to install some other things on it to run on my phone was another 600ish MB and it took me more than an hour to download that game and I was in an area where I was getting approximately 13mbps. Hopefully the Google Nexus 5 unveils before the end of Q1 or Q2 of 2013 and a release date of summer. Plus I am also anxious to see the Samsung Galaxy Note III when Samsung finally unveils it! I want a taste of T-Mobile 4G LTE already! Come on! 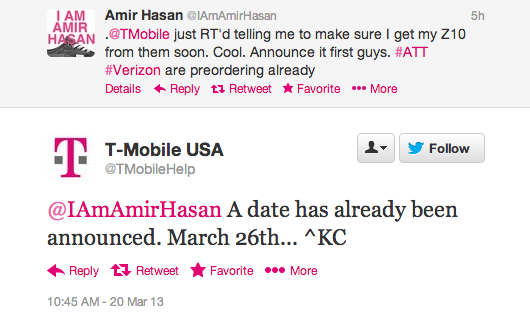 Can’t wait for the HTC One and Samsung Galaxy S IV to come to T-Mobile! Faster than my cheap AT&T Wi-Fi internet as well. Most of the time on my home internet, I am getting under 1mbps and rarely 2-3mbps max. My upload is so horrible as well. 20MB? Don’t you mean 20mb? MB is Mega Byte which is bigger than mb which is mega bits. 1 Mega Byte = 8 mega bits I believe. Put up a new YouTube channel today. Check it out in an 30 minutes. Going to upload vids on my HTC One X running 4G LTE with T-Mobile. Search NYCTheBronx in about half an hour. No, I mean 20 “Mb” M = Mega, b = bit. An “m” would mean “milli-“, and I don’t think anyone’s internet is quite that slow. Trust me. I got the cheap AT&T bipolar home internet plan. We pay only 15-20 bucks a month for it lol. Hey TMo, Having a pre-order page for business customers doesn’t make you first to launch. That was a lame. As with every BlackBerry T-Mobile has ever launched, it’s available to Business customers to order… and they get it earlier than the actual launch date… so technically, yes, it does make them first to launch. Do you know a business customer with one in-hand? Can you verify your “technically first to launch” claim? Have phones been delivered? I don’t think they have, but I’d love to be proven wrong. MY BAD!!! One guy, who had to beg to get one, has one. TMobile was first with the Z10 in the USA!!!! Thanks for the link. Wish they would release the pricing…. The Small Business team has been selling them for a week now. They can do personal activation also. That’s how I got mine. Great!! Also on the 26th… the first LTE mobile broadband will be available!!!! It’s a fantastic phone. You guys will be happy, for those that gave BB a chance with the 9900, give them another. The software on this phone is so intuitive, you will hear people complain about app availability but keep in mind it’s a whole new OS, everyone seems to forget how it was when the iPhone and G1 came out. My wife bought a 9900 when they were first released (despite my advice not to) and she has had nothing but issues with it. Crashes/freezes all the time, misses text messages, internet connection only works about a third of the time. We’re stuck with the POS until July when she’s eligible for upgrade. That’ll be cool. I had the ups and downs of getting one from a third party that I had to exchange due to a defective Wi-fi antenna. The waiting game begins again. I hope T-Mobile has a lot more to announce on March 26th besides the new Blackberry and the Uncarrier thing, which they’ve already announced for all practical purposes. My hope is that they announce the turning on of a whole bunch of new 4G towers and lay out their LTE map. Of course, I was told by T-Mobile last year all the horribly slow Edge in my area would be converted to 4G by the end of last year, which hasn’t happened so I’m not holding my breath – just keeping hope alive. I had a crackberry a few years back on t-mobile. Never had so many issues with a phone in my life. Never again. Whats the deal with the SG3 lte? Are there still plans to release it on the 27th? Guess we’ll find out. THIS. My wife has been a crackberry addict for years, and after about a year they turn into an unworkable, crashing POS. She’s finally giving up on them and going to go Android. So im getting mixed information. Is the Z10 really launching on the 26th? Im seeing reports that its launching on the 27th . . anyone have any other supporting information to go along with this twitter post?